Bread craft is really made of bread slices and needs no cooking or baking and is air dried. 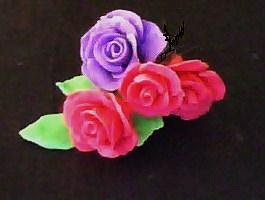 One can easily make beautiful roses , flowers and other items with it. Its non-edible of course ! Remove crusts from the slices , mash the slices to powdery consistency . Add all the rest of the ingredients to form a smooth dough. It could be sticky in the beginning but fear not as it will dry up pretty fast. Use powder on hands while kneading the dough and while making dough craft. Using lemon juice or vinegar hopefully reduces the chances of insects making a merry feast of the decorative item ! The dough can be kept in the fridge in an air tight container or plastic wrap for a few days. After the glue is mixed the dough becomes inedible. Please let me know if you find another recipe, would love to try.